There’s something interesting about every team, at every point in the season. Each week I’ll examine a different one, tackling a different topic each day. This is normally a Monday post. Forgive it’s tardiness. Hell yeah, they’re over .500, bros! Last night, with a 4-1 victory over the Dodgers, the Pirates pushed their record to 18-17. That means that they have at least one more day with a .500 or better record, which, at this point, is significant in Pittsburgh. When they wrapped up a victory on Sunday they reached .500 again, the latest date at which they had an even record since 2004. After that things got pretty ugly, which makes this year’s run that much more enjoyable. Even in 2004, when they made it 44 games with at least a .500 record, they finished well below that mark at 72-89. 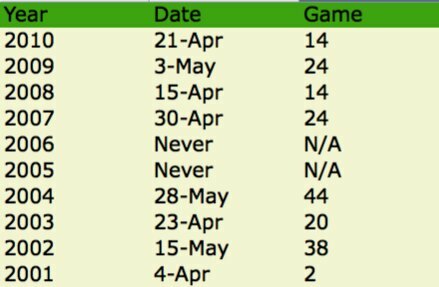 That is, the first 35, 40, even 50 games of the season aren’t necessarily a portent for 162. 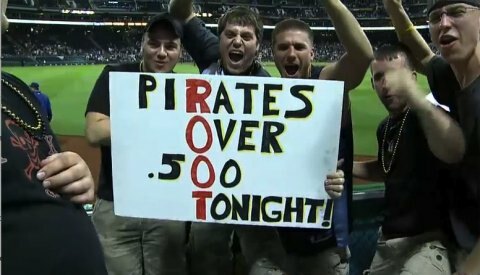 Even still, it’s hard to not get at least a little excited about the Pirates’ performance to date. If nothing else, it has helped tuck away grim memories from the past six years. On offense the Pirates don’t look too pretty, though this is the case of a few players dragging down the group. Lyle Overbay (80 wRC+), Pedro Alvarez (60 wRC+) and Ronny Cedeno (30 wRC+) are putting a drag on total offensive production. They all have over 100 PA and have started the great majority of the team’s games. Even if the Yankees replaced their three worst hitters with these guys they’d have trouble scoring runs. Worse for the Pirates, they represent more than 1/3 of the lineup, since they have the pitcher’s spot. The woeful hitting of that trio has diminished the contributions of a number of players. Garrett Jones, for instance has murdered the ball this season, producing a .259/.370/.494 line (143 wRC+) in his first 100 PA. He is in a strict platoon with Matt Diaz, and it has allowed him to flourish. It would help if Diaz, signed because of his ability to hit lefties, held up his end of the bargain (60 wRC+ in 64 PA), but the production from Jones is nothing but a positive. Neil Walker, too, has impressed in his sophomore season, hitting .295/.368/.442 (130 wRC+) and putting himself in the top-five second basemen conversation. Positionally, the Pirates are getting the most out of their catchers. At 123 wRC+ they rank third in the majors and first in the NL. Ryan Doumit, a rare holdover from the Dave Littlefield days, has hit well in his limited time, as has Chris Snyder since returning from injury. So while the Pirates trail at the infield corners, they excel at the infield pinnacle. It’s not likely to last — neither Snyder nor Doumit profiles as a 120 wRC+ player at this point in their careers — but it has helped keep the offense moving as they experience difficulties elsewhere. Pitching and fielding has the Pirates right around the middle of the pack, which is perhaps a bit better than one might expect. Last year the Pirates were pretty lousy at both, but we’ve seen a turnaround this year. Defense brings the biggest surprise, as they had the worst UZR in the league this year. This year they’re in the positives and right around the middle of the pack. Defensive efficiency, which I prefer when looking at whole teams, paints a similar picture. On the mound it appears that Paul Maholm has gotten back into a groove, as his ERA more closely mirrors his FIP and xFIP than it did last year. Kevin Correia has proven an excellent addition, and even though his 2.91 ERA won’t hold for much longer, he’s still contributed to the team’s record to this point, and likely has a number of good starts left in him. James McDonald, after impressing in the second half of last year, stumbled out of the gates but has pitched well of late. And Charlie Morton has been one of the biggest surprises this year, pitching to a 3.13 ERA in his first seven starts. This isn’t a blow-you-away rotation, but they have a number of decent contributors who can help keep the team in games. If they can find one or two who can contribute as their younger pitchers come up, all the better. From a long viewpoint the Pirates’ outlook hasn’t changed too much. They’re still a middling team that, thanks to some exciting young talent, can catch fire from time to time. It’s commendable that they’re above .500 at this point into the season, after flailing badly for the past six years. They’re not out of the water yet, of course. As we move through this week I’ll examine different aspects of the Pirates that will affect their 2011 season and beyond. For now, suffice it to say that there hasn’t been a better time to be a Pirates fan in two decades. We hoped you liked reading Team of the Week: Pittsburgh Pirates by Joe Pawlikowski! What’s Right With Anibal Sanchez? a pirates article with no mention of andrew mccutchen?? absurd!! In fairness, the article was titled “Team of the *Week*”… meanwhile, McCutchen has a .646 OPS in May, and a .636 OPS over the last 7 days.